Between August and October we had a survey up on the website for people to ask us their neck & shoulder pain questions. Thank you to everyone who took the time to give us their questions. In this post, we’ve taken some of the most popular questions and answered them here. As the old saying goes, if one is asking it then ten are thinking it! Feel free to browse the full article, or click the links for specific questions. 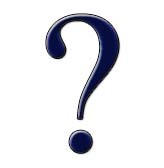 If your question isn’t on here, please let us know in the comments. If you have desk-related neck and shoulder pain and would like to get started on improving it, you can download our free guide to help your neck and shoulder pain here. What is causing the pain? What could I do to avoid/prevent neck & shoulder pain? How to ease the pain, i.e. best exercises to do or how to help recovery (without impacting on my ability to work at a desk). 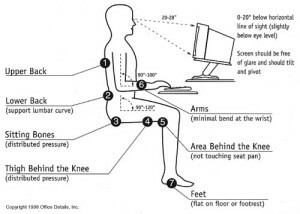 How do I position myself at my desk, i.e. what is the correct posture? Am I doing more harm than good by using a technique like a tennis ball? Why is my neck sore in the morning after sleeping? Why is it spreading down my elbows? I sit in a small office with air con behind me and have many symptoms (pain around shoulder blade, and down forearm/wrist), however when I went on holiday to a warmer location my pain disappeared. Could it all be caused by the air con? The majority of the time, neck & shoulder pain from sitting at a desk is caused by incorrect posture. When the muscles are held in an imbalanced position, certain muscles (specifically, muscles at the back of the neck, upper back & tops of the shoulders) are tensing up the entire time you’re in poor posture. Other muscles, like the chest and front of the shoulders and front of the neck, slowly become shorter, making it more difficult to hold good posture when you try to. The number one thing you can do is change your posture. This is one of those things that’s much easier said (I mean, it’s only 3 words) than done. This is probably completely changing the way you hold yourself. If you’ve had bad posture for a long time, you’ll need to do stretches to lengthen tight muscles and exercises to strengthen weak muscles. How to ease the pain, i.e. best exercises to do or how to help recovery (without impacting on my ability to work at a desk)? Believe it or not, you can actually work at a desk and not have neck and shoulder pain – you just need to change some habits. The first thing you should do is start to open up the front of your body. I strongly recommend a chest stretch to start with, along with strengthening the back (say, with Brueger’s postural relief). We did a guide on posture at a desk last November, and it has great videos explaining the chest stretch and strengthening the upper back muscles. You can read that post here. If you’d like a downloadable, portable guide, you can get it emailed to you here. How about a handy graphic? Here ya go! But in all seriousness, DON’T pull your shoulder blades up and together. That will just cause a host of problems. Again, the free guide has a step-by-step desk posture outline along with a simple technique to make it more of a habit. Actually, you could be (thanks for this one Lilian!). Usually we use a tennis ball where we feel the pain, which isn’t usually the cause of the imbalance. In the tight chest/sore upper back scenario, the tight chest is making the back to overwork and develop tension. If you use a tennis ball on the knots in your back without stretching your chest, it’s like asking your upper back to go into spasm. However, if you are stretching your chest AND releasing with a tennis ball, you should be okay. It’s all about balance. Opinions vary on this one. I know a lot of practitioners believe that’s an indication of inflammation. In my experience, where people have a lot tension in their neck, their neck hurts in the morning. Then, when we get rid of the tension in their neck, they no longer wake up with a sore neck. I believe that, similar to how our muscles are cold before we exercise, but become more limber as we warm-up, our muscles are ‘cold’ in the morning, i.e. stiff, and therefore any tension we have is magnified. Then, as you get up and start moving around, your muscles get a little ‘warmer’ and as your muscle become slightly more elastic the tension doesn’t affect you as much. You may also want to check that you’re not subconsciously holding tension while you fall asleep. When you’re in bed, take a deep breath and see if you can ‘let go’ of your head or shoulders. I often do this, and then check again five minutes later and I’m once again holding on to my head. Don’t keep yourself awake with it (that would be counterproductive) but checking a couple times may help you let go of some of the tension that you hold without realising in your sleep. There can be a lot of causes for this. A lot. First off, any tingling or numbness down your arms should be checked by a doctor, who may want to refer you on to a physio or other professional. Sometimes muscle tension can impinge upon nerves, and I have helped a number of people with pain down the arm with releasing muscles, but it is always better to check a symptom like that with a doctor to rule out anything more serious than muscle tension. Once any structural or more serious problems have been ruled out, releasing muscles in the neck and realigning the shoulder girdle, plus working on any tension in the arm, forearm, and wrist can really help with any pain that’s started spreading down the arm. There are two things to look at here. First of all, similar to the sleep issue, when you have tension in your neck and shoulders, cold will make your pain worse. Sitting stationary next to an air conditioner would definitely cool your muscles down, while being in hot weather and moving around more often would make you feel much better. Secondly, it is really hard not to lift your shoulders and duck your neck down when air is being blown on you, even if you don’t have pre-existing tension. Something simple like wearing a light scarf to cover the back of your neck would probably help and make it much easier to have good posture. Try that and let me know how you go. That’s the majority of them! I’d say the most popular were how to sit at a desk, what causes it and how to help it, so hopefully this, our posture article from last month and the free guide helped. If you’d like more information, you can always come in for a session where we can assess which muscles are tight and where your posture pulls you, to give you specific advice for your situation. If you liked these tips and would like more detail, why not enrol in our free 7-day minicourse for neck & shoulder pain? Click here to sign up and start helping your neck & shoulder pain today! ← How Are You on One Leg?